Most people know that outdoor air pollution damages their health. But did you know that, according to the Environmental Protection Agency (EPA), your home's pollutants levels may be 2 to 5 times – and even more than 100 times – higher than outdoor pollutant levels? Because of their prominence in your home, indoor air pollutants have been ranked among the top five environmental risks to public health. They cause subtle problems and can agitate the allergies and asthma symptoms of those in your family. So, what's the solution? Whole-home air cleaners can catch a variety of contaminants in your home--leaving nothing but a literal breathe of fresh air. Want to keep your home's air clean? 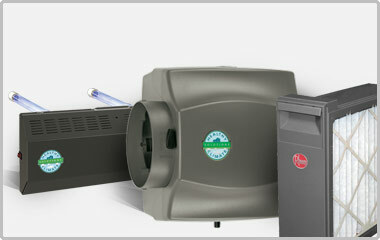 Contact us online or call 1-800-888-1045 for more details about the air cleaners we provide. There are 3 main types of whole-home air cleaners. Each has a different purpose based on the type of pollutants you want to clean out of your home. Install this if you want to remove: Particles (including dust, dust mites, tobacco smoke smoke, pollen, animal dander) and they can catch some molds, bacteria and viruses. Mechanical air filters: This is what a HEPA air filter is. It draws your air through a fibrous or metal filter to trap the particles. It's designed to catch tiny particles that your normal air filter can’t. Electronic air filters: Uses electrostatic attraction to catch particles out of the air. It does this by shocking particles to give them a charge and then uses a collector plate of an opposite charge to attract and trap the particles. How it works: Removes gases and odor from your home's air using a sorbent (a material used to absorb water or gas) that absorbs the pollutants. Sorbents are used in gas masks to protect people from harmful gases. Install this if you want to remove: Biological pollutants including: viruses, molds and bacterium. How it works: Uses ultraviolet radiation from UV lamps to destroy viruses, bacteria, allergens, and molds that are growing on surfaces in your heating and cooling system such as cooling coils, drain pans or ductwork.